This will be a very active and guitar-filled week at the Robert and Carol Center for 21st Century Music. 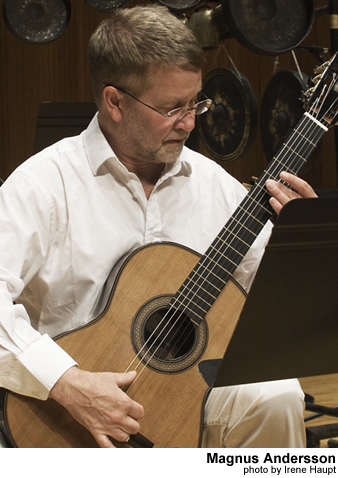 Magnus Andersson, virtuoso guitarist and long time friend of the Center, will be at UB premiering student works written especially for him at an informal workshop and recording session on September 28. 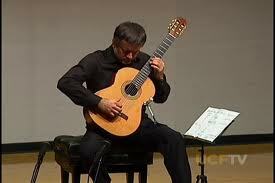 The following day he will be joined by Arturo Tallini for a concert of today’s most demanding and complex pieces for guitar duet in Baird Recital Hall. Wednesday’s program of solo readings will feature six of UB’s graduate composers: Daniel Bassin, Juan-Colón Hernandez, Colin Tucker, Zane Merritt, Nathan Heidelberger, and Chung Ting Pang. The informal session will take place at 3:00 p.m. in Baird Recital Hall on Wednesday, Sep. 28, and will be a great opportunity to hear new music from UB’s incredibly creative and diverse body of young composers. Daniel Bassin’s piece, Gerard, features a timbrally evocative tuning with a unique microtonal scordatura and borrows from Olivier Messiaen’s musical alphabet, which Messiaen created to transcribe theological writings into his musical works. Language plays a large role in some of the other pieces we will hear Wednesday as well – Nathan Heidelberger’s a refrain One keeps playing year after year, concerning the nature of things as they are, includes text adapted from Wallace Steven’s 1937 book of poetry, “The Man with the Blue Guitar,” and will showcase Magnus Andersson’s vocal talents as he speaks and sings the text, simultaneously mimicking the diverse sounds of the guitar he is performing on. The graduate student composers at the University at Buffalo bring their originality from tremendously different geographic and aesthetic backgrounds, and tomorrow will be a terrific opportunity to hear all the diversity and talent staged back-to-back and performed by a world-class musician. On Thursday, September 29, at 7:30 p.m. in Baird Recital Hall, Arturo Tallini will team up with Magnus to present a concert of modern composers who have written for guitar duet, including Bruno Maderna, Sylvano Busotti, Brian Ferneyhough, and Helmut Lachenmann. Lachenmann’s piece, Salut für Caudwell, artfully runs through a dizzying combination of guitar techniques and performance styles, and includes sounds from the entire body of the guitar, as well as incorporates fingertips, knuckles, the guitar slide, picks, and a wide variety of other plectrums. Both performers speak text from British author Christopher Caudwell and Friedrich Nietzsche while they play, often hocketing with the music and creating a delightful interplay of words and sounds. Thursday’s concert will be a great chance to hear some of the most creative and demanding pieces for guitar duet written in the past few decades. Below is an excellent video feature of Magnus Andersson and Arturo Tallini performing Ferneyhough’s No time (at all), at the Conservatorio di Musica S. Cecilia in Rome, Italy, from March of 2010.